(Newser) – A 17-year-old male shot multiple times in the head began moving under a sheet in Chicago, triggering a failed attempt to save him. 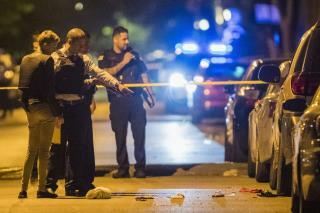 Paramedics had arrived early Monday on the scene of a shooting after two vehicles were seen circling a party at a housing complex near the University of Illinois-Chicago campus around 4:45am, per CBS News. A 22-year-old woman identified as Shalonza E. McToy was one of what was initially thought to be two deceased victims, per WLS. But teenager Erin Carey, covered with a sheet for at least an hour as paramedics moved on to other victims, suddenly began moving his arms and legs, reports the Chicago Tribune. Following CPR, he was taken to a hospital on full life support, but he died shortly after 1am Tuesday, reports WGN. Al Sharpton should be slamming the crips & bloods and their violent gang culture. Violent Hip Hop music too. The NRA had nothing to do with it. The most important sentence is the very last one stating witnesses refuse to cooperate. Like why wouldn't you want a group of murderers locked up as opposed to be free and kill again. Sorry to say it but triage also takes into account in war situations the severity of the injury. Several gunshots to the head would be less chance of surviving than say a chest wound. Don’t know if that is what someone decided. Go to the ones you can save. This was brought out many times in the old program “MASH”, set during the Korean conflict when ambulances arrived carrying multiple wounded personnel. Triage carried that principle over to civilian life when there is multiple wounded, like in this situation. That’s the way it is.